← How to extract text from PostScript file? Question: I just purchased VeryPDF PDF to Word because I need to maintain my hyperlinks when converted. The website said that it can do that but it is not. What do I need to do to maintain all formatting and the links? 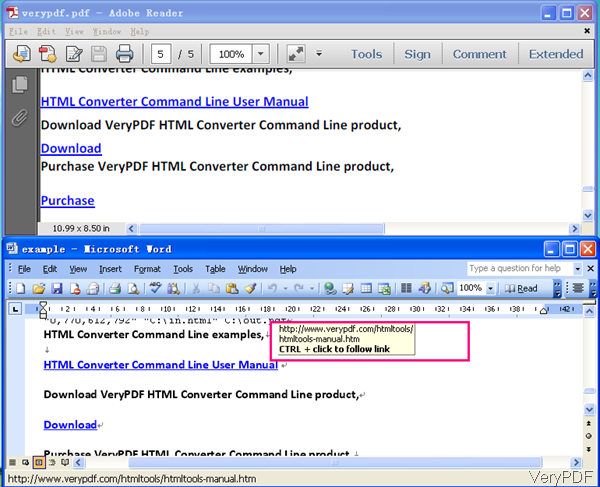 Answer: PDF to Word Converter can help you convert PDF to word and keep hyperlinks. But different with other hyperlinks which can lead you the aim website directly, the output converted by this software need to add hyperlink effect manually. All the link addressed have been saved. In the following part, maybe you can master the conversion method and get vivid proof of this judgment. Note: this software only can work under all the Windows system both 32-bit and 64-bit. If you need to use the Mac version of PDF to Word Converter, please use software PDF to Any Converter for Mac. Let us download PDF to Word Converter and use it together. This software has user friendly software interface, so we need to install it. The installation method is quite easy. Simply double click the downloaded exe file and following the installation message. Once the installation finishes, there will be an icon on the desktop. Double click the icon then you can launch this software. Drag PDF file needed converting to the software interface, then the menu dialogue box will bounce into the screen. The following snapshot is from the Preference menu options. 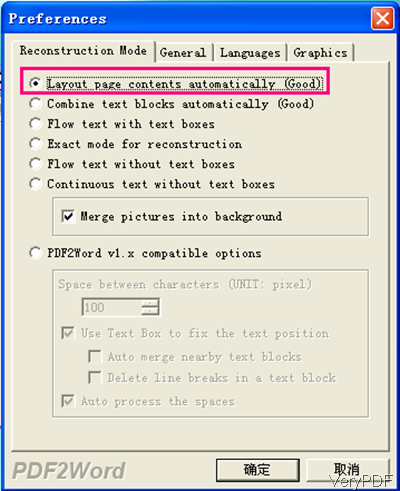 As we need to keep hyperlinks and layout with good quality, so please choose option Layout page contents automatically (good) in the Reconstruction Mode menu tab. This option is necessary, as to other options setting, please set them according to your needs. Once the setting finishes, please click button OK then the conversion will be run at once. A few seconds later, the output word file will open automatically. Now let us check the conversion effect from the following snapshot. Through compare the input PDF and output word document, we can deduce that PDF to Word Converter does help you do the conversion and keep hyperlinks. But there is still one limitation that we need to fix in the future edition, we will try to let the converted output keep the hyperlinks effect then you can click it directly to the aim website. Note: this software only can convert text based PDF to word and keep hyperlinks. If your PDF belongs to image PDF which can not do copy and paste in the PDF reader, this software can not do the conversion. And one great feature I need to note here that if your PDF is text based PDF, there is no language limitation. If you use the trial version, it only can convert the first three pages of the whole PDF. When you use the registered version, this limitation will be removed. This entry was posted in PDF to Word Converter and tagged keep hyperlink, PDF to Word. Bookmark the permalink.